The orange-blazed Black Forest Trail (BFT) may be the most challenging and rewarding backpacking resource in Pennsylvania. 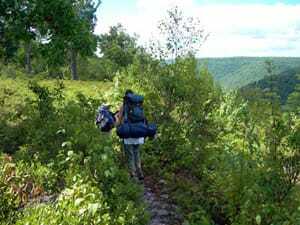 This spectacular long-distance loop trail leads through and above the west side of Pine Creek Gorge in the northwest corner of Lycoming County. This very rugged trail charges into and out of the chasm several times, with many very steep ascents and descents, before leveling out on top of the plateau around PA 44. The trail features many outstanding vistas in all directions, with views over Morris Run, Big Dam Hollow, Young Woman’s Creek, Baldwin Branch, Callahan Run, Naval Run, Little Slate Run, and Pine Creek. The Black Forest Trail system was constructed by the Bureau of Forestry. The book 50 Hikes in Central Pennsylvania (2001), by Tom Thwaites, features three day hikes on particularly interesting sections of the Black Forest Trail. Two connector trails, the North Link and South Link, connect the BFT to the Susquehannock Trail, and the T-Squared Trail connects the BFT to the Donut Hole Trail. Near the BFT trailhead in Slate Run, you can use the Pine Creek Rail- Trail to connect with the West Rim Trail and the Mid State Trail upstream in the Blackwell area. All of these long-distance backpacking options are described in detail in separate entries in this chapter. The primary trailhead is just outside Slate Run in the depths of Pine Creek Gorge, reached via PA 414 north of Waterville. Drive west, then north, on Slate Run Road for .8 mile to a pine plantation. The BFT officially begins and ends here. There are several other access points, particularly on PA 44 above the gorge. See the trail guide for details. The Black Forest Trail has been prone to horse damage; please contact the state forest office to report trail misuse. The Black Forest Trail embroidered patch is available at KTA's Bookstore. 10 Lower Pine Bottom Rd.